Years ago I was asked to write an article for food and wine magazine about high end Italian vineyards opening their doors to the public. The Italians, so the argument went, were becoming more French. I arrived in Friuli and fell in love with the place, particularly the town of Udine and the rows of Enotecas where every wine was available by the glass. The area specialised in Pinot Grigio, not the type of insipid white pedalled in supermarkets, but full-bodied whites which owed their depth of colour to the skin of the grape. The experience was one I will never forget. The only problem was that the magazine had been pitched the idea for the story by a PR firm. While the Enotecas were refreshingly egalitarian, top Italian vineyards weren’t interested in the touring public. Visits were still by appointment and really only for trade buyers. A closed door policy predominated. I was reminded of this experience by recent attempts to visit Chateau Simone near Aix and Chateau Mauconseil just outside Cadenet. I encountered the latter wine in one of the smarter delis in Lourmarin priced at over 20 euros a bottle. A Luberon white commanding this sort of price is either a seasonal joke at the expense of the hordes of tourists, or something worth investigating. I chose to interpret it at as the latter. As I usually do in France, I didn’t bother to call in advance and just rocked up at the Chateau, located half way in between Vaugines and Cadenet. I’d passed the sign countless times on the road before and paid no attention. In particular I hadn’t noticed the large double height gates barring the way. I pressed the buzzer. No-one answered. I took the phone number and called a little later. I arrived dutifully on time. The gates were once again shut. I buzzed. This time someone answered. Madame was not at home. I protested I had a meeting. I was told to wait. After another 20 minutes I buzzed again. I was told to wait. Minutes passed. I heard the crunch of tyres on gravel. The long drive that led up to the Chateau swung away passed a field of wheat, up a hill into the distance. A jeep came into view. The open-backed type favoured by security firms, so that men can hang off the sides ready to jump into action. It parked opposite the gates, and a man got out, leant on the door and stood staring at me through dark glasses. He reached into his pockets, and swiftly brought his right arm up in a jerky motion. This is it, I thought, he’s going to Taser gun me for trespassing. Instead the gates swung open. No words were exchanged. I followed the jeep up the road towards the chateau. Before visiting I’d done a little research into the place. Turreted and imposing the Chateau had been built in the 13th century by the Knights Templar. It was a place built to withstand attack and hold prisoners. A vast network of underground tunnels and dungeons used to link it with Chateau d’Ansouis over five kilometres away. Up, up, we went climbing towards the castle, until swinging around one final turn we reached what once must have been the stable block. The security men had abandoned their jeep and disappeared. I stood in the silent courtyard and looked around. Above me, loomed the turrets of the castle. Narrow windows filled the slits from which arrows used to be fired. Five or six black crows dived low, cackling over my head. Then silence. I waited. Madame arrived, nut brown skin, flowery sun dress, and a perfume trail coalescing in the air behind her. Evelyn held her hand out in the dainty manner of a princess, with a slight loose wrist for me to support. She smiled with glorious white teeth, ‘Welcome to Chateau Mauconseil,’ and in that instant, I forgot about the gate and the security men and in my mind the castle metamorphosed from a Templar fortress into a fairy tale castle. 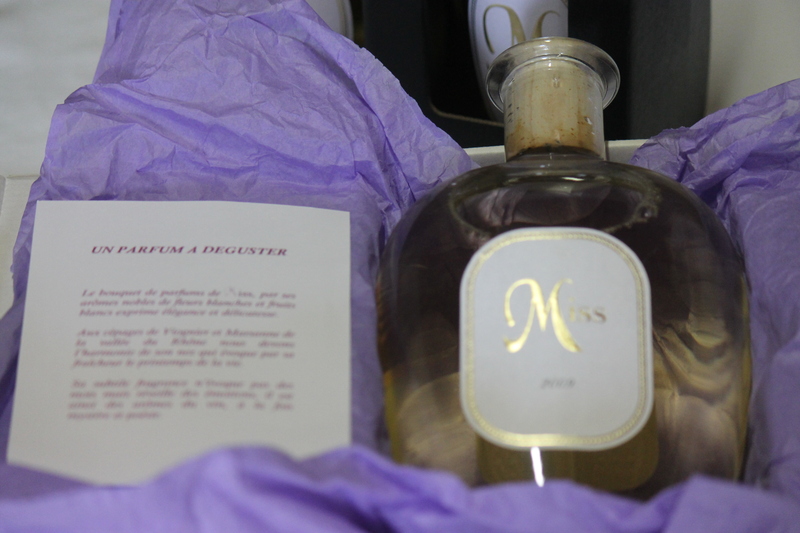 A perfume bottle for a perfumed wine! ‘How many bottles do you make a year?’ I asked anxiously. I wondered if Evelyn had any idea just how much wine a thirsty horde of Brits could get through in the Provencal sunshine. 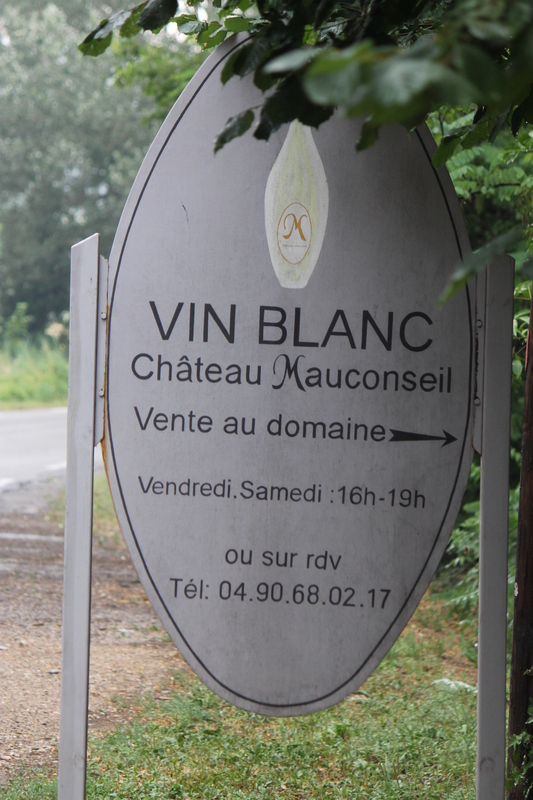 If they were Madame’s guests for a long weekend, a quarter of the vineyard’s production could disappear. I tasted the wine. Mauconseil is a wonderful golden colour, a heavily perfumed wine, which lasts for a couple of seconds in the mouth, with hints of honey. It is made from a combination of Marsanne, Roussanne and Voignier varietals more common in the Rhone valley, and is not dissimilar in style to some Chateauneuf whites I’ve sampled recently. In the Luberon it’s unique, and because of the grape varieties chosen the wine is not accorded a.o.c status. It seems then that the justification for the 22 euro Luberon white is not a joke at the expense of the tourist wallet, but rather simply a case of supply and demand. If you’d like to try a Luberon wine with a difference, and are not too price conscious, my advice is buy some soon. After a wedding of 250 Brits, this year, the wine is going to be in shorter supply than ever! Personally I’m off to Italy on holiday to find something a little cheaper. At the beginning of this year William Chase of Tyrrell’s crisp fame purchased Chateau Constantine Chevalier just outside Lourmarin. Planning a holiday in the south of France, then see our Provence villa rental pages. We’ve also got a fantastic selection of top Provence boutique hotels. And before you arrive be sure to cook some of our great Provence recipes from our Provence food pages.